Fathi, E., Farahzadi, R., Rahbarghazi, R., Samadi Kafil, H., Yolmeh, R. (2017). Rat adipose-derived mesenchymal stem cells aging reduction by zinc sulfate under extremely low frequency electromagnetic field exposure is associated with increased telomerase reverse transcriptase gene expression. Veterinary Research Forum, 8(2), 89-96. Ezzatollah Fathi; Raheleh Farahzadi; Reza Rahbarghazi; Hossein Samadi Kafil; Rahman Yolmeh. "Rat adipose-derived mesenchymal stem cells aging reduction by zinc sulfate under extremely low frequency electromagnetic field exposure is associated with increased telomerase reverse transcriptase gene expression". Veterinary Research Forum, 8, 2, 2017, 89-96. Fathi, E., Farahzadi, R., Rahbarghazi, R., Samadi Kafil, H., Yolmeh, R. (2017). 'Rat adipose-derived mesenchymal stem cells aging reduction by zinc sulfate under extremely low frequency electromagnetic field exposure is associated with increased telomerase reverse transcriptase gene expression', Veterinary Research Forum, 8(2), pp. 89-96. Fathi, E., Farahzadi, R., Rahbarghazi, R., Samadi Kafil, H., Yolmeh, R. Rat adipose-derived mesenchymal stem cells aging reduction by zinc sulfate under extremely low frequency electromagnetic field exposure is associated with increased telomerase reverse transcriptase gene expression. 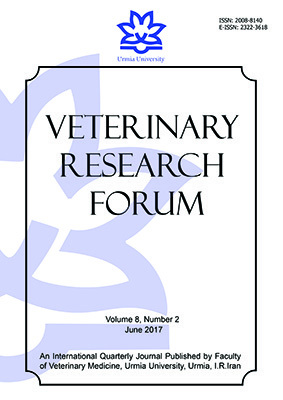 Veterinary Research Forum, 2017; 8(2): 89-96. Zinc as an essential trace element was reported to be involved in regulation of the growth and aging of cells. In this study, rat adipose-derived mesenchymal stem cells were exposed to extremely low frequency electromagnetic field (ELF-EMF) of 50 Hz and 20 mT to evaluate whether exposure to ELF-EMF in the presence of zinc sulfate (ZnSO4) affects the telomerase reverse transcriptase (TERT) gene expression and aging in mesenchymal stem cells (MSCs). The cell plates were divided into four groups including group I (control without ZnSO4 and ELF-EMF exposure); group II (ELF-EMF-exposure without ZnSO4); group III (ZnSO4 treatment without ELF-EMF exposure) and group ІV (ELF-EMF exposure with ZnSO4). In the presence of different concentrations of ZnSO4,cells viability, TERT gene expression and percentage of senescent cells were evaluated using colorimetric assay, real-time PCR and senescence-associated β-galactosidase activity assay, respectively. In this experiment, cells were exposed to ELF-EMF for 30 min per day for 21 days in the presence and absence of ZnSO4. The results revealed that ELF-EMF leads to a decrease in the expression of TERT gene and increase in the percentage of senescent cells. However, the ZnSO4 could significantly increase the TERT gene expression and decrease the aging of ELF-EMF-exposed MSCs. It seems that ZnSO4 may be a beneficial agent to delay aging of ELF-EMF-exposed MSCs due to the induction of TERT gene expression. Zinc as an essential trace element was reported to be involved in regulation of the growth and aging of cells. In this study, rat adipose-derived mesenchymal stem cells were exposed to extremely low frequency electromagnetic field (ELF-EMF) of 50 Hz and 20 mT to evaluate whether exposure to ELF-EMF in the presence of zinc sulfate (ZnSO4) affects the telomerase reverse transcriptase (TERT) gene expression and aging in mesenchymal stem cells (MSCs). The cell plates were divided into four groups including group I (control without ZnSO4 and ELF-EMF exposure); group II (ELF-EMF-exposure without ZnSO4); group III (ZnSO4 treatment without ELF-EMF exposure) and group ІV (ELF-EMF exposure with ZnSO4). In the presence of different concentrations of ZnSO4,cells viability, TERT gene expression and percentage of senescent cells were evaluated using colorimetric assay, real-time PCR and senescence-associated β-galactosidase activity assay, respectively. In this experiment, cells were exposed to ELF-EMF for 30 min per day for 21 days in the presence and absence of ZnSO4. The results revealed that ELF-EMF leads to a decrease in the expression of TERT gene and increase in the percentage of senescent cells. However, the ZnSO4 could significantly increase the TERT gene expression and decrease the aging of ELF-EMF-exposed MSCs. It seems that ZnSO4 may be a beneficial agent to delay aging of ELF-EMF-exposed MSCs due to the induction of TERT gene expression. The use of human beings as the test model is impossible and the long-term observation of a test group could be affected by other factors such as dietetic habit and inherited disease.22 Certainly, stem cells could be the best choice for experimental studies.23 Any small influence on stem cells may cause unexpected results to their related adult cells.4,24 Furthermore; studies on the influence of ELF-EMF on stem cells are rare. To date, the effects of ELF-EMF in the presence of zinc sulfate (ZnSO4) are yet to be reported on the TERT gene expression and senescent adipose-derived mesenchymal stem cells (ADSCs). This study was carried out to evaluate the effect of ZnSO4 on TERT gene expression and aging of ELF-EMF-exposed rat primary adipose MSCs. All chemicals, unless specified, were purchased from Sigma-Aldrich (St. Louis, USA). All cell culture plasticware was from SPL Life Sciences (Pocheon, Korea). The type of this study was experimental study. Detection of ADSCs markers by Immuno-cytochemistry. A total of 4 × 104 cells from passage four were seeded in a 24-well culture plate. After one day of culture, cells were washed three times with PBS and fixed in 4% paraformaldehyde for 30 to 60 min at room temperature. After fixation, the paraformaldehyde was removed and cells were then washed two times with PBS and once with PBS and 1% bovine serum albumin (BSA). Cells were incubated overnight at 4 °C with a 1:100 dilution of monoclonal antibodies (mAbs) against CD73, CD90, CD45 and CD56 (BD Biosciences, San José, USA) in PBS and 1% BSA. Cells were then washed three times with PBS and 1% BSA and incubated with a 1:500 dilution of biotin-conjugated mouse monoclonal IgG1 antibody against rat in PBS and 1% BSA for one hr. After three washings with PBS, a 1:500 dilution of Streptavidin Alexa Fluor™ 488 conjugate (Molecular Probes, Eugene, USA) was added for 1 hr. Cells were washed three times with PBS and nuclei were stained with 7.50 µM propidium iodide (PI) for 15 min. After washing three times with PBS, cells were covered with Vectashield mounting medium (Vector Laboratories Inc., Burlingame, USA) and visualized under the fluorescence microscope. The pluripotent capacity of the isolated MSCs was confirmed with adipogenic and osteogenic differentiation. RNA extraction and reverse transcription (RT)-PCR analysis of bone and adipose tissue-specific genes expressions. Total RNA from the osteogenic and adipo-genic differentiated cells was isolated using trizol reagent (Invitrogen).26 Extracted cellular RNA was dissolved in diethyl phosphorocyanidate-treated water. After DNase treatment by DNase I amplification grade kit (Invitrogen), 2 µg RNA were used for the first strand cDNA synthesis in a total volume of 20 µL according to the manufacturer’s guidelines. The thermal program for PCR was an initial denaturation for 15 min at 94 °C followed by 28 cycles of 1 min at 94 °C, 1 min at 55 °C, 56°C, 59 °C, 58 °C and 56 °C (an optimised annealing temperature for alkaline phosphatase (ALP), osteocalcin (OCN), PPAR-alpha, PPAR-gamma and GAPDH primers, respectively), and 1 min at 72 °C with a final 10 min extension at 72 °C. Reaction mixtures for PCR included 20 ng cDNA, 10 µL TEMPase Hot Start 2x Master Mix І Blue (Ampliqon A/S, Odense M, Denmark), 0.50 µM of each antisense and sense primer as follows: ALP (NM_ 013059.1): 5' CCTTGAAAAATGCCCTGAAA-3' (forward), 5'- CTTGGAGAGAGCCACAAAGG -3' (reverse), osteocalcin (OCN) (NM_001278484.2): 5'- GTCCCACACAGCAACTGC-3' (forward), 5'-CCAAAGGCTGA AGCTGCCG-3' (reverse). PPAR-alpha (NM_013196.1): 5'- CCCTGCCTTCCCTGTGAACTGAC-3' (forward), 5'-GGGACTCATCTGTACTGGTGGGGAC-3' (reverse). The PPAR-gamma (NM_013124.3): 5'-GGTGA AACTCTGGGAGATCC-3' (forward), 5'-TGAGGGAGTTTGAAGACTCTTC-3' (reverse). GAPDH (NM_017008.4): 5'-ATGACTCTACCCACGGCAAG-3' (forward), 5'-CTGGAGATGGTGATGGGTT-3' (reverse) and 9. Amplified PCR products were analyzed by ethidium bromide staining after 1.5% agarose gel electrophoresis.30,31 The PCR primers were designed with Oligo primer design software (version 7.0; National Biosciences, Plymouth, USA). The ELF-EMF system and exposure protocol. The EMF device was designed and manufactured by University of Tabriz in Iran. The EMF was generated by a parallel set of Helmholtz solenoid coils with 500 turns of 0.70 mm coated copper wire. Each solenoid diameter was 27 cm. The coil was placed into the cell incubator; the field was set to 50 Hz electromagnetic field frequency and generated a magnetic flux density of 20 mT as previously described.4 The EMF-exposed plates were placed in the center half way between the plains of coils to receive a uniform field for 30 min per day for 21 days. Sham-exposed control samples were kept under the same conditions but in another incubator, without using EMF. The CO2 concentration, temperature and humidity of the sham-exposed control samples were similar to EMF-exposed samples. The value of the alternating magnetic field was measured continuously using an EFA-2 field analyzer with a 3 cm diameter probe. Statistical Analysis. The results were analyzed using the software program Graph Pad Prism (version 6.01; Graph Pad Prism, Chicago, USA). We used one-way and two-way ANOVA followed by Dunnett’s post hoc test to determine the significant difference among groups. Statistical significance was determined at p < 0.05. All experimental procedures were repeated for three times. Phenotypical characterization of ADSCs. The ADSCs had the capacity to adhere to plastic flasks in culture and morphologically, they appeared as spindle-shaped cells both as scattered individuals and in small colonies. After three passages, red blood cells were seldom seen by microscopy. Immunocytochemical images revealed that cultured cells were consistently positive for CD73 and CD90 and negative for CD45 and CD56 (Fig. 1. A to D). The ADSCs were able to differentiate towards the adipogenic and osteogenic lineages. AdipogenicdifferentiationofADSCs. Positive adipogenic differentiation was determined by Oil Red-O staining and molecular analysis. Treated ADSCs with adipogenic differentiation media were stained positive with Oil Red-O staining (Fig. 1E). The expression of peroxisome proliferator-activated receptor-gamma (PPAR-α) and PPAR-γ as adipocyte-specific genes were detected by RT-PCR analyses. These results confirmed that our isolated cells were MSCs. Fig. 1. Identification of rat adipose tissue-derived MSCs. Fluorescence microscopy analysis for expression of cell markers of MSCs. A) CD 73, B) CD 90, C) CD 45 and D) CD 56. Nuclei were labeled with PI (orange). E) Adipogenic differentiation. Arrows show lipid vacuoles generated after adipose differentiation. F) Expression of fat-specific genes (PPARα and PPARγ). G) Osteogenic differentiation and cell aggregates (stained with alizarin red staining). Arrows show some of the mineralized cell aggregates (bar = 200μm). H) The RT-PCR analysis and detection of two bone specific genes including alkaline phosphatase (ALP) and osteocalcin (OCN) after osteogenic differentiation. Osteogenic differentiation of ADSCs. The osteogenic differentiation was evident in alizarin red staining. After staining, redness of the nodules indicated the presence of mineralized compartments as a result of the osteogenic treatment(Fig. 1F). The RT-PCR analysis confirmed the expression of bone-specific genes including ALP and OCN in the treated cells. Determination of ZnSO4 effect on cell proliferation by MTT assay. As shown in Figure 2, ZnSO4 had no significant effect on ADSCs proliferation at concentrations of 1.40 and 0.014 µg mL-1, but at concentration of 0.14 µg mL-1 significant proliferative effect was seen (p < 0.05). We used 0.14 µg mL-1 ZnSO4 in a complete culture medium to treat the cells. Fig.2. Rat adipose tissue-derived MSCs viability analysis in the presence of different concentrations (1.40, 0.14 and 0.014 µg mL-1) of ZnSO4 for 21 days by a MTT assay. * indicates significant differences among the groups as p < 0.05. The effect of ZnSO4 on TERT expression under 50 Hz, 20 mT EMF. Real-time PCR for detection of TERT gene expression in ADSCs was carried out after exposure to an electromagnetic field of 50 Hz, 20 mT for 30 min per day for 21 days in the presence and absence of 0.14 µg mL-1 ZnSO4. The results showed that in groups II, III and ІV (50 Hz, 20 mT EMF exposure with 0.14 µg mL-1 ZnSO4), TERT mRNA expression decreases (1.70 fold, p < 0.05), increases (3.70 fold, p < 0.0001) and increases (1.90 fold, p < 0.01) as compared with group I, respectively. Meanwhile, in group ІV TERT mRNA expression remarkably increased (4.60 fold) as compared with group II, (p < 0.0001; Fig. 3. A and B). Effect of ZnSO4 on senescent cells under 50 Hz/20 mT EMF. The SA-β-gal activity assayfor detection of senescent cells was carried out after exposure to an EMF of 50 Hz, 20 mT for 30 min per day for 21 days in the presence and absence of 0.14 µg mL-1 ZnSO4. The results showed that in group II, percentage of β-galactosidase positive cells was increased as compared with group I (p < 0.05). Meanwhile, percentage of β-galactosidase positive cells in group III and group ІV was decreased as compared with group I (p < 0.05) (Fig. 3 C and D). Fig. 3. A) Effect of 0.14 µg mL-1 ZnSO4 and 50 Hz, 20 mT ELF-EMF on the mRNA expression level of TERT, analyzed by real-time PCR and also normalized against β-actin. Compared with the ELF-EMF-exposed group in the absence of ZnSO4, the mRNA expression level of TERT was significantly higher in cultured cells under ELF-EMF in the presence of 0.14 µg mL-1 ZnSO4; B) Detection of TERT gene expression in four groups (control, EMF-exposed, ZnSO4-exposed and EMF + ZnSO4-exposed) on agarose gel. * indicates significant differences among the groups as p < 0.05; while ** p < 0.01) and **** p< 0.0001); C) Effect of 0.14 µg mL-1 ZnSO4 and 50 Hz, 20 mT ELF-EMF on the β-galactosidase positive cell percentage. Senescent cells were first observed at passage three and their number was increased with passages. Compared with the ELF-EMF-exposed group in the absence of ZnSO4, the percentages of β-galactosidase positive cell were significantly lower in cultured cells under ELF-EMF in the presence of 0.14 µg mL-1 ZnSO4; D) Senescence related β-galactosidase positive rat adipose tissue-derived MSCs (bar = 200 μm). * indicates significant differences among the groups as p < 0.05. Due to increased use of ELF-EMFs for domestic and industrial appliances in the last few years, different in vivo and in vitro studies have been conducted on the influence of these fields on various biological functions such as tumor growth, neurodegenerative diseases, free radical production, gene expression, growth, aging and differentiation potential of MSCs.29 Since the MSCs are attractive candidates for cell-based tissue regeneration, finding EMFs effects on MSCs is important for researchers.38,39 Aging of MSCs is one of the conditions that may be caused by EMFs. Aging is an inherently complex process that is manifested within an organism at molecular and cellular levels. While the fundamental mechanisms are still poorly understood, telomere shortening and reduction of TERT expression are one of the cellular markers of aging and/or cell death.40 Molecular control of stem cell aging is highly regulated by two different, telomerase-independent and telomerase-dependent pathways.16 Epigenetic events play a role in the telomerase-independent senescence pathway. Therefore, finding ways to reduce the replicative senescence is definitely attractive in cell transplantation approaches. The results of EMFs studies are different because of the difference in the magnetic field intensity and frequency and duration of exposure.5 Reportedly, REAC acts on a gene and protein expression program of both telomerase-independent and telomerase-dependent patterns to optimize stem cell ability to cope with senescence progression.15 It seems that gene expression regulation may be directly involved in differentiation potential and aging in stem cells. It has been demonstrated that TERT over-expression can prevent the human MSCs senescence and the cells showed significantly higher and unlimited proliferation capacities.41 It was found that 50 Hz, 0.50 and 1 mT magnetic fields can promote survival and proliferation of the human ADSCs.42 There is no substantial evidence for the effects of ELF-EMF on TERT expression. In this regard, an understanding of the TERT expression underlying the regulation of telomerase activity might allow the modulation of telomerase expression and thus, cell lifespan. At present, finding ways to reduce the reduction of TERT expression and cellular senescence caused by ELF-EMF is definitely attractive. In the present study, 0.14 µg mL-1 was used as the final concentration of ZnSO4. To determine a suitable range for ZnSO4 under this study experimental conditions, MTT assay was used to evaluate cell viability. In this study, it was discovered that ZnSO4 has no impact on the viability of cells below 0.14 µg mL-1 and above 0.14 µg mL-1. The previously described exposure condition was used in this study.4 Real-time PCR was used to explore the mechanism of ELF-EMF in the presence of ZnSO4 on ADSCs aging at the molecular level and the mRNA expression of TERT was detected. The results of this study showed that in cultured cells under EMF in the presence of 0.14 µg mL-1 ZnSO4 (group IV), TERT mRNA expression remarkably increased (4.60 fold) when compared with EMF-exposed group (group II). Previous reports provided the first evidence that metals, especially Zn+2 can modulate telomerase in cancer cells by inducing an enhancement of its activity.18,43 On the contrary, it has been reported that zinc phthalocyanine (ZnPc) has the ability to inhibit telomerase activity.44 In this study, β-galactosidase staining method was used as a common method to study cells senescence in vitro, in order to examine the percentages of the senescent ADSCs in our studied culture condition.45 According to our observations, ß-galactosidase positive cells were first observed at passage three and their number increased as the passage number increases. The results of the present study showed that senescence related β-galactosidase positive cells at passages 3, 5, 7 and 9, under EMF in the presence of 0.14 µg mL-1 ZnSO4 (group IV) decreased significantly when compared with the EMF-exposed group (group II). The effects of ZnSO4 on TERT gene expression and aging of ADSCs under ELF-EMF are yet to been investigated, but the role of Zn+2 in growth regulation was evaluated.46 However, the findings of this study are in agreement with the hypothesis that 0.14 µg mL-1 ZnSO4 as an antioxidantcan prevent the aging of ADSCs under 50 Hz, 20 ELF-EMF by increasing TERT gene expression and ADSCs aging reduction. Although the underlying mechanism remains unclear, but few studies have been published confirming the effectivness of zinc on telomeres. Reportedly, octa-cationic zinc phthalocyanine (ZnPc) can induce intra-molecular G-quadruplex telomeric structure transition from the antiparallel to parallel form.44 It has been shown that 80 µm L-1 ZnSO4 helps to maintain and shorten the telomere length of hepatocytes L-02 and hepatoma cells SMMC-7721.47 It was found that the molecular mechanism might be related to inhibition of telomerase activity in SMMC-7721 cells. It might also be the result of p53 protein activation, a zinc-binding transcription factor that responses to multiple forms of stress and controls proliferation, survival, DNA repair and cells differentiation. Therefore, supplementation of zinc could affect the transcription of DNA and telomere length by activation of p53 in hepatoma cells.48 According to the aforementioned reports, in the present study, it was suggested that ADSCS aging prevention in the presence of ZnSO4 may be due to changes in TERT gene expression, telomerase activity, telomere structure and telomere length. In conclusion, the findings of this study showed that the TERT gene expression significantly increased while the percentage of senescent cellsdecreased under ELF-EMF of 50 Hz, 20 mT in ZnSO4-treated ADSCs when compared to untreated cells. The results suggested that 50 Hz, 20 mT magnetic field could affect the senescence and cellular aging due to TERT gene expression; although, the detailed mechanisms are still unclear. More studies are recommended on the effects of magnetic fields on telomere length and telomerase activity of stem cells. The authors wish to thank Prof. Mohammad-Ali Hosseinpour Feizi for providing magnetic field system. This work was supported by a grant (No. S/27/3523-2, 08/02/1393) from the University of Tabriz, Tabriz, Iran. Fathi E, Farahzadi R. Effect of electromagnetic field on acetylcholinesterase activity: In vitro study. Afr J Biochem Res 2012; 6: 8-13. Volpe P. Interactions of zero-frequency and oscillating magnetic fields with biostructures and biosystems. Photochem Photobiol Sci 2003; 2(6): 637-648. Jadidi M, Safari M, Baghian A. Effects of extremely low frequency electromagnetic fields on cell proliferation. Koomesh 2013; 15(1): 1-10. Yan J, Dong L, Zhang B, et al. Effects of extremely low-frequency magnetic field on growth and differentiation of human mesenchymal stem cells. Electromagn Biol Med 2010; 29(4): 165-176. Saino E, Fassina L, Van Vlierberghe S, et al. Effects of electromagnetic stimulation on osteogenic differentiation of human mesenchymal stromal cells seeded onto gelatin cryogel. Int J Immunopathol Pharmacol 2011; 24: 1-6. Grassi C, D’Ascenzo M, Torsello A, et al. Effects of 50 Hz electromagnetic fields on voltage-gated Ca2+ channels and their role in modulation of neuroendocrine cell proliferation and death. Cell Calcium 2004; 35: 307-315. Flores I, Blasco MA. The role of telomeres and telomerase in stem cell aging. FEBS Lett 2010; 584(17): 3826-3830. Ornish D, Lin J, Chan JM, et al. Effect of comprehensive lifestyle changes on telomerase activity and telomere length in men with biopsy-proven low-risk prostate cancer: 5-year follow-up of a descriptive pilot study. Lancet Oncol 2013; 14(11): 1112-1120. Li K, Zhu H, Han X, et al. Ectopic hTERT gene expression in human bone marrow mesenchymal stem cell. Life Sci J 2007; 4(4): 21-24. Murillo-Ortiz B, Albarrán-Tamayo F, Arenas-Aranda D, et al. Telomere length and type 2 diabetes in males, a premature aging syndrome. Aging Male 2012; 15(1): 54-58. Consales C, Merla C, Marino C, et al. Electromagnetic fields, oxidative stress, and neurodegeneration. Int J Cell Biol 2012; dx.doi.org/10.1155/2012/683897. Sanz A, Stefanatos RK. The mitochondrial free radical theory of aging: A critical view. Curr Aging Sci 2008; 1(1): 10-21. Srdjenovic B, Mrdjanovic J, Galovic A, et al. Effect of ELF-EMF on antioxidant status and micronuclei in K562 cells and normal lymphocytes. Cent Eur J Biol 2014; 9(10): 931-940. Fathi E, Farhzadi R. Survey on impact of trace elements (Cu, Se and Zn) on veterinary and human mesenchymal stem cells. Rom J Biochem 2015; 52: 67-77. Farahzadi R, Mesbah-Namin SA, Zarghami N, et al. L-carnitine effectively induces hTERT gene expression of human adipose tissue-derived mesenchymal stem cells obtained from the aged subjects. Int J Stem Cell 2016; 9(1): 107-114. Rinaldi S, Maioli M, Pigliaru G, et al. Stem cell senescence. Effects of REAC technology on telomerase-independent and telomerase-dependent pathways. Sci Rep 2014; 4(6373): 1-8. Doraiswamy PM, Finefrock AE. Metals in our minds: Therapeutic implications for neurodegenerative disorders. Lancet Neurol 2004; 3(7): 431-434. Nemoto K, Kondo Y, Himeno S, et al. Modulation of telo-merase activity by zinc in human prostatic and renal cancer cells. Biochem Pharmacol 2000; 59(4): 401-405. Ghasemzadeh-Hasankolai M, Batavani R, Eslaminejad MB, et al. Effect of zinc ions on differentiation of bone marrow-derived mesenchymal stem cells to male germ cells and some germ cell-specific gene expression in rams. Biol Trace Elemen Res 2012; 150(1-3): 137-146. Truong-Tran AQ, Carter J, Ruffin RE, et al. The role of zinc in caspase activation and apoptotic cell death. Biometals 2001; 14(3-4): 315-330. Nakatani T, Tawaramoto M, Kennedy DO, et al. 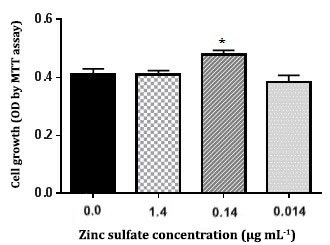 Apoptosis induced by chelation of intracellular zinc is associated with depletion of cellular reduced glutathione level in rat hepatocytes. Chem Biol Interact 2000; 125(3): 151-163. Saleh M. The impact of mesenchymal stem cells on differentiation of hematopoietic stem cells. Adv Pharm Bull 2015; 5(3):299-304. Rafi MA. Gene and stem cell therapy: Alone or in combination? Bioimpacts 2011; 1(4): 213-218. Ejtehadifar M, Shamsasenjan K, Movassaghpour A, et al. The effect of hypoxia on mesenchymal stem cell biology. Adv Pharm Bull 2015; 5(2):141-149. Ko KS, Lee IW, Joo WI, et al. Differentiation of human adult adipose derived stem cell in vitro and immuno-histochemical study of adipose derived stem cell after intracerebral transplantation in rats. J Korean Neurosurg Soc 2007; 42: 118-124. Fathi E, Farahzadi R. Enhancement of osteogenic differentiation of rat adipose tissue-derived mesenchymal stem cells by zinc sulphate under electromagnetic field via the PKA, ERK1/2 and Wnt/β-catenin signaling pathways. PloS one 2017; 12(3): e0173877, doi: 10.1371/journal.pone.0173877. Amirkhani MA, Mohseni R, Soleimani M, et al. A rapid sonication based method for preparation of stromal vascular fraction and mesenchymal stem cells from fat tissue. Bioimpacts 2016; 6(2): 99-104. Baghaban Eslaminejad M, Mardpour S, Ebrahimi M. Mesenchymal stem cells derived from rat epicardial versus epididymal adipose tissue. Iran J Basic Med Sci 2011; 14(1): 25-34. Alipour F, Parham A, Mehrjerdi HK, et al. Equine adipose-derived mesenchymal stem cells: phenotype and growth characteristics, gene expression profile and differentiation potentials. Cell J 2015; 16(4): 456-465. Hagh MF, Noruzinia M, Mortazavi Y, et al. Different methylation patterns of RUNX2, OSX, DLX5 and BSP in osteoblastic differentiation of mesenchymal stem cells. Cell J 2015; 17(1): 71-82. Mobarak H, Fathi E, Farahzadi R, et al. L-carnitine significantly decreased aging of rat adipose tissue-derived mesenchymal stem cells. Vet Res Commun 2016; doi:10.1007/s11259-016-9670-9. Wang T, Zhang JC, Chen Y, et al. Effect of zinc ion on the osteogenic and adipogenic differentiation of mouse primary bone marrow stromal cells and the adipocytic trans-differentiation of mouse primary osteoblasts. J Trace Elem Med Biol 2007;21(2):84-91. Fathi E, Farahzadi R, Charoudeh HN. L-carnitine contributes to enhancement of neurogenesis from mesenchymal stem cells through Wnt/β-catenin and PKA pathway. Exp Biol Med 2017; 242 (5): 482-486. Livak KJ, Schmittgen TD. Analysis of relative gene expression data using real-time quantitative PCR and the 2− ΔΔCT method. Methods 2001; 25(4): 402-408. Aminizadeh N, Tiraihi T, Mesbah-Namin SA, et al. Stimulation of cell proliferation by glutathione monoethyl ester in aged bone marrow stromal cells is associated with the assistance of TERT gene expression and telomerase activity. In Vitro Cell Dev Biol Anim 2016; 52(7): 772-781. Brazvan B, Farahzadi R, Mohammadi SM, et al. Key immune cell cytokines affects the telomere activity of cord blood cells in vitro. Adv Pharm Bull 2016; 6(2):153-161. Baghaban Eslaminejad MR, Jahangir SH, Aghdami N. Comparison of proliferation, senescence and differentiation into skeletal cell lineages of murine bone marrow-derived and amniotic fluid mesenchymal stem cells. Iran Red Crescent Med J 2010: 12(6): 615-623. Fathi E, Farahzadi R. Isolation, culturing, characterization and aging of adipose tissue-derived mesenchymal stem cells: a brief overview. Braz Arch Biol Technol 2016; 59. Gholizadeh-Ghalehaziz S, Farahzadi R, Fathi E, et al. A mini overview of isolation, characterization and application of amniotic fluid stem cells. Int J Stem Cells 2015; 8: 115-120. Ave SB. Extremely low—frequency electromagnetic fields. Pak J Biol Sci 2007; 10(22): 4108-4112. Böcker W, Yin Z, Drosse I, et al. Introducing a single‐cell‐derived human mesenchymal stem cell line expressing hTERT after lentiviral gene transfer. J Cell Mol Med 2008; 12(4):1347-1359. Razavi S, Salimi M, Shahbazi D, et al. Extremely low-frequency electromagnetic field influences the survival and proliferation effect of human adipose derived stem cells. Adv Biomed Res 2014; 3: 25. Leitzmann MF, Stampfer MJ, Wu K, et al. Zinc supplement use and risk of prostate cancer. J Natl Cancer Inst 2003; 95(13): 1004-1007. Ren L, Zhang A, Huang J, et al. Quaternary ammonium zinc phthalocyanine: Inhibiting telomerase by stabilizing g quadruplexes and inducing g‐quadruplex structure transition and formation. Chembiochem 2007; 8: 775-780. Matsunaga H, Handa JT, Aotaki-Keen A, et al. Beta-galactosidase histochemistry and telomere loss in senescent retinal pigment epithelial cells. Invest Ophthalmol Vis Sci 1999; 40(1):197-202. Wu K-J, Grandori C, Amacker M, et al. Direct activation of TERT transcription by c-MYC. Nat Gene 1999; 21(2): 220-224. Verma S, Tachtatzis P, Penrhyn-Lowe S, et al. Sustained telomere length in hepatocytes and cholangiocytes with increasing age in normal liver. Hepatol 2012; 56(4): 1510-1520. Liu Q, Wang H, Hu D, et al. Effects of trace elements on the telomere lengths of hepatocytes L-02 and hepatoma cells SMMC-7721. Biol Trace Elem Res 2004; 100(3): 215-227.